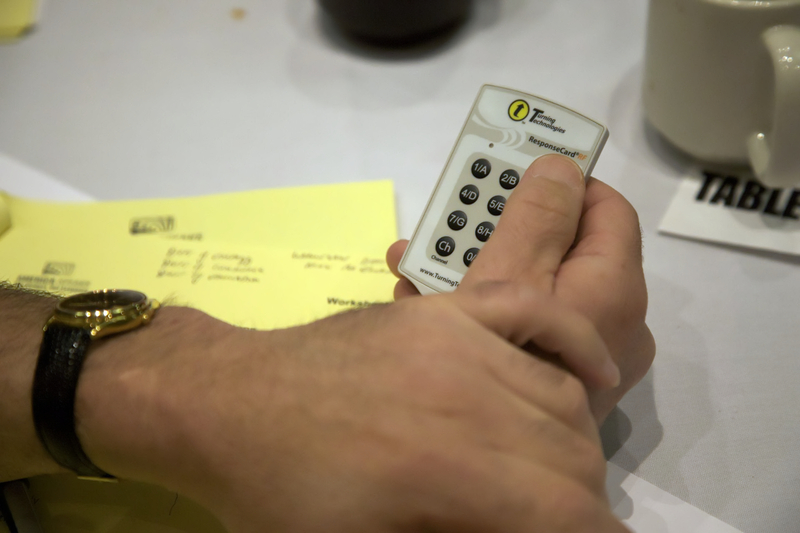 AmericaSpeaks’ keypads at tables in multiple locations enable integrated visioning and planning on a scale to match the Mississippi River. The rules for gaining public support for an idea, cause or product have changed dramatically. Just ask chief marketing officers for Fortune 500 companies, candidates for public office and non-profit directors. These changes have important implications for integrated approaches to watersheds, especially big ones like the Mississippi River. We all know we increasingly rely on our iPhones and iPads for communication and for entertainment. But the world of collaboration software is expanding rapidly, too, and it’s making a difference to international business as well as urban planning, transportation scheduling and economic development. Not surprisingly, technology development is coinciding with dramatic changes in expectations for decision making. Those expectations are being addressed in software for collaboration, deliberation and creative problem solving to address large scale and complex issues. It’s an opportune moment to pull these developments together for a vision and inclusive stakeholder collaboration for the future of the Mississippi River watershed. First, the increasing use of technology – not just social networking – to problem solve, to collaborate across large geographic tracts and to integrate widely disparate and complex areas of expertise makes integrating disciplines and geographic sectors possible. The economies of technology for collaboration are increasingly attractive, too, especially in an era of low budgets and complex issues. Some examples of well-known software include Huddle, Microsoft SharePoint, Scribe and Do.com. Many lesser known software tools are emerging rapidly to address more specific collaboration needs. And, of course, the rapid rise in phone app use adds to this trend. Second, expectations for public decision making are changing. Some of this may be due to technology driving public awareness. Or perhaps it’s due to, as Tom Friedman says, the world becoming increasingly flat. Regardless, people expect their communities, corporations and, even their churches, to be more transparent, inclusive and responsive to their needs. They expect schools and teachers to inform them and include their input into curriculum, sports and social events. People working in corporations expect to work in teams to decide product design and, even pricing, not just be told to execute the plan. And, yes, this trend is being seen throughout the world where decades-long dictators are being overthrown – or threatened – through accessible, public on-line organizing. Third, apply what we know from research about people’s willingness to commit and act on behalf of an idea or a cause if they engage in deliberative decision-making. Xavier de Souza Briggs, MIT, in his book Democracy as Problem Solving, explains that collective, democratic decision-making has the ability to go beyond understanding issues to building constituency and the capacity of that constituency to make necessary change happen. He differentiates traditional concepts of democracy that pertain to whom we elect and how we steer government from democracy today that’s more focused on a collective search for better and less self-interest-driven bargaining. A number of organizations now exist creating standards and putting these practices into play: National Coalition for Dialogue and Deliberation www.ncdd.org and the International Association of Public Participation www.iap2usa.org are two of the leaders. Enter technology- aided deliberative democracy as a 21st century approach to reaching a shared vision and an integrated river management system for the Mississippi River watershed. What we’ve had since the early 20th century is a Mississippi River management plan based on the knowledge and technical expertise of that era. It was also based on an early 20th century America – less urban and more rural, more agricultural, and less densely populated. Then the plan morphed according to the needs of specific interests at specific river locations. As time went on and the science of water quality developed, fish and wildlife expertise developed, economies of different regions developed, more variations were added. That’s why today we have a hodge-podge and multitude of governing authorities each with differing objectives and measurements for success. The social and technological tools already exist for a 21st century planning process for a unified vision and management plan for the Mississippi River. It goes beyond calling meetings, launching one-way communications campaigns, and only addressing the usual suspects. As stakeholders in the Mississippi River, we need only look outside our traditions and professional perspectives and test some of the new tools and processes. We also need to open the process to ALL stakeholders and adhere to the 7 Core Principles of Public Engagement http://tiny.cc/dvvtiw to ensure trust and effectiveness. It’s an enormous watershed system and America’s great waterway, but we have what is needed to address it in an integrated, sustainable and unified way. This entry was posted in Future of the Mississippi River and tagged A 21st Century Approach to the Mississippi River, A National Dialogue for the Future of America's Waterway, America's Waterway, AmericaSpeaks, Mississippi River. Bookmark the permalink.